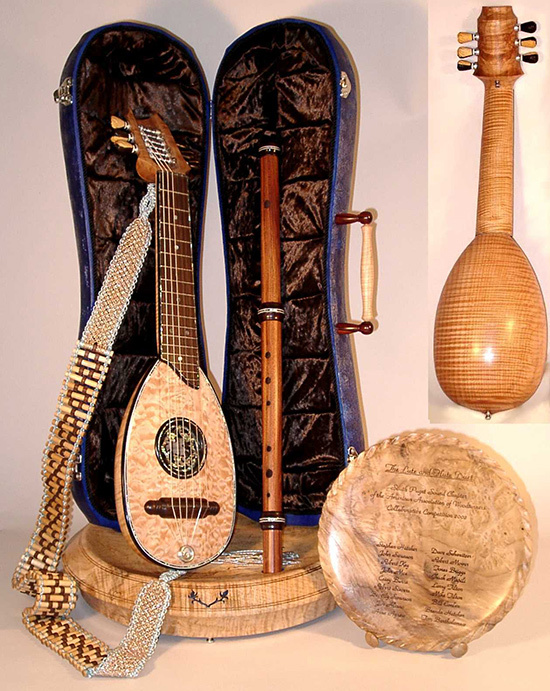 Description: As chapter president in 2002, Stephen Hatcher brought his design of a woodturned lute to the club as the basis of a chapter collaborative challenge. He served as chief designer with the invaluable assistance of David Schweitzer (master of all skills) and Casey Burns (master lute maker). Nineteen members contributed their time and creativity to the project. The completed project received no award or recognition from the AAW (not even a photo in American Woodturner, not that there are any sour grapes there). It was displayed proudly the following year at the Utah Woodturning Symposium then as a center piece in the woodturning exhibit "Cambium Layers", and remains a centerpiece for chapter exhibitions. Note: the notebook PDF was created in 2002 and you may encounter text font substitution errors depending on the version of your PDF reader.